The 2050SU Deluxe Broadcast spreader is perfectly sized for use on medium to large lawns. 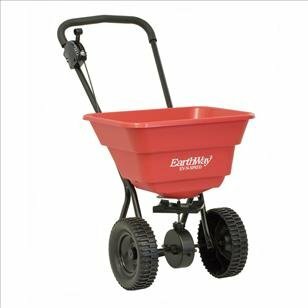 The rust proof 80lb capacity hopper and 10" deep lug wheels brings capacity and ease of use to the homeowner. This fully assembled spreader with folding handle will be ready to go from box to lawn in seconds and stores easily. The easy use gauge and lever assembly allows the user complete control over the application of material, coupled with our exclusive EV-N-SPRED®3-Hole Drop Shut-Off System, the 2050SU gives the homeowner professional results. To make establishing the correct setting rate for any product easy, we include a rate calculation Matrix for use with all of today's granular products including organic materials, to give you the best setting available. The 2050SU is the choice of the homeowner looking for performance and results on a budget. 80lb/36kg Hopper capacity. Rustproof poly construction, 10"/25cm diameter deep-lug poly wheels, 100lb/45kg Load bearing capacity.